The new US-1 drone by Impossible Aerospace claims to be the highest performance aircraft with electric propulsion. By designing the drone’s power source to double as the primary structure of the aircraft, the US-1 drone takes a new approach towards the aircrafts design, allowing the drone to reach flight times of two hours and speeds of up to 42 MPH. Engineered and assembled in the United States, the US-1 uses several lithium ion batteries spread out throughout the primary structure of the drone, this patent pending design allows the drone to support the energy needed to maintain flight and at the same time benefits the drone with a sturdy frame. 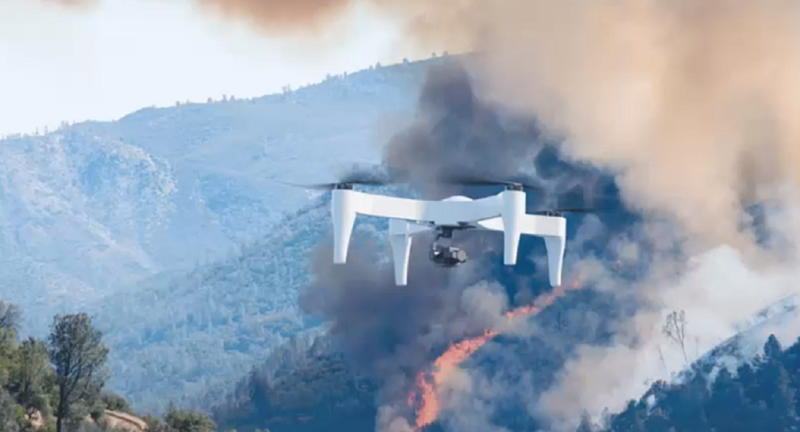 Launching in 2018, the US-1 is a quadcopter drone intended for use by police, firefighters, search and rescue teams, and other first responders. Impossible Aerospace’s website mentions how the drone’s unique design makes it possible to carry a payload of up to 1.3 kgs, which allows drone operators to attach optical and thermal cameras such as the Sony R10C and the FLIR Duo Pro, as well as multispectral sensors which are used for detecting and tracking targets. For continuous missions, where it may be necessary to keep the US-1 hovering for over 2 hours, the operator could easily swap the payload of the energy depleted drone with a different, fully charged one. So by using 2 drones, the operator can maintain persistence on a target, even when running low on battery. If another fully charged drone isn’t available, then the US-1 can quick-charge 75% of its battery in just 45 minutes. This option, however, would be less ideal for more sensitive tracking or following missions. Just recently, “InsideUnmannedSystems.com” reports that SWAT forces managed to safely arrest an armed gunman with the help of the US-1. The gunman barricaded himself in a diner in Campbell, California, after threatening an employee with a gun. SWAT forces attempted to draw him out by throwing tear gas into the diner. Making its first public appearance, the US-1 managed to pick up images showing tear gas leaking from one of the vents in kitchen, this allowed the SWAT team to better adjust their plan. Furthermore, the drone supplied the forces with constant real-time intelligence of the crime scene, intelligence that granted the first responders a sense of security and a better understanding of the situation.